Captured near her village in the Darfur region of the Sudan and enslaved in 1875 as a young girl of about six, this saint was so traumatized that she could not remember her given name. The Arab slavers then gave her the name Bakhita, Arabic for "the fortunate one." This proved to be prophetic. Even as a slave undergoing unspeakable torture and living in the harshest of conditions, Bakhita noted the beauty of the world and wondered who it was that created all of this beauty. Bakhita was sold many times until, in 1883, at about the age of fourteen, she was sold to the Italian Consul to the Sudan. Though still a slave, Bakhita began to be treated more like one of the family. In 1885, the consul and his family moved back to Italy and Bakhita was turned over to the Michieli family. The Michielis soon moved to Venice with Bakhita, who was now the nanny to their young daughter, Mimmina, going along. Mimmina was enrolled in a convent school run by the Sisters of Charity in Canossa where Bakhita accompanied her to class. The catechism classes taught by the sisters were Bakhita’s introduction to God, the creator of the beautiful world that Bakhita so loved, and to the Catholic Church. In 1888, business interests caused the Michieli family to return to the Sudan. They hoped to take Bakhita, now almost a family member, with them. Bakhita, while recognizing that her position was now more than a slave and also her love for her young ward, wished to remain in the convent and to become a Catholic, something that might not be possible in the Sudan. While Bakhita pondered this decision, her case was brought before an Italian tribunal. The judge ruled that, since the Sudan had enacted a law outlawing slavery shortly before she was born, Bakhita had never been a slave in the first place. Bakhita stayed in the convent as a catechumen and, in 1890, received the sacraments of initiation. She took the name, Josephine Bakhita, at that time. So pleased to find the god that she had been searching for through her life, Bakhita later wrote, "If I were to meet the slave-traders who kidnapped me and even those who tortured me, I would kneel and kiss their hands, for if that did not happen, I would not be a Christian and Religious today..."
Josephine Bakhita remained in the Canossian convent and took her vows as a religious in 1896 and dedicated the remaining years of her life to God, her "Master." Josephine would perform simple tasks such as cooking, sewing, and answering the door for the next fifty years. Transferring to a convent in Schio in 1902, she continued her loving care for those she encountered. Greeting and blessing the children coming into school and taking care of the poor endeared her to the people of Schio who, to this day, refer to her as "our Black Mother." In her later years, Josephine became ill and suffered greatly. Even in her suffering, she accepted this as God's will for her and never failed to have a smile for those who came to see her. At her death in 1947, the people of the town lined up to view their "Black Mother" one last time. 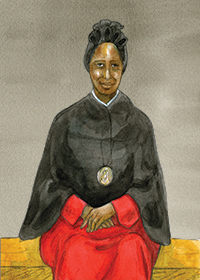 Pope John Paul II beatified Josephine Bakhita in 1992 and canonized her on October 1, 2000. She is the patron saint of the Sudan and is honored by a feast day in that country on February 1. Josephine Bakhita's message today: Few have suffered as Josephine Bakhita did in her lifetime. Yet her strong faith in God sustained her and gave her the strength to pass her love on to others. Are you able to accept the trials that fall upon you in your life and still love God and your neighbor?